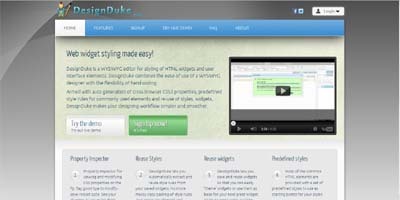 DesignDuke is a WYSIWYG editor for styling of HTML widgets and user interface elements. DesignDuke combines the ease of use of a WYSIWYG designer with the flexibility of hand coding. Armed with auto generation of cross browser CSS3 properties, predefined style rules for commonly used elements and re-use of styles, widgets, DesignDuke makes your designing workflow simpler and smoother. DesignDuke simplifies your design workflow and resides entirely in cloud. Evolve your designs with a single click!